Kaplan GRE continues to hold its own as a powerhouse in test prep, and for good reason. With live courses all over the country (currently available in 40+ states), several customizable online course options, free GRE study resources, and a money-back guarantee, Kaplan is a solid choice for GRE preparation. Take advantage of Kaplan’s 180+ hours of content, 7 full-length computer tests, and more than 5,000 practice items to CRUSH the GRE! There is a Kaplan GRE test prep option for just about every study style and schedule. Choose from in-person, live online, and self-paced courses and a variety of tutoring options. 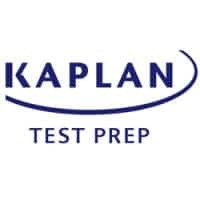 The Kaplan courses are the most widely available in person test prep course as well, with classes offered in 46 states. If you are interested in the structure of a classroom, but have a busy schedule, Kaplan may be the best option for you. They have the most location and timing options of all test prep courses currently on the market. They also offer live online options for those that would prefer to learn from an instructor, but aren’t near a test center or would like to study from home. There are practically limitless options for days and time, including evenings and weekends, so they can fit into almost any schedule. In addition to being available just about everywhere and anywhere, Kaplan has the widest variety of packages. From a $49 Rapid Review Live for GRE Math and month-to-month access to their QBank, the Kaplan quiz bank, to full service one-on-one tutoring packages, Kaplan has a package for almost every student and budget. Each course comes with the choice of adding on a “Plus” option that includes private coaching and additional resources for an extra $400 (an extra $200 for the self-paced course). For example, if you choose the GRE Prep – Live Online course and add the “Plus” package, you’ll get 3 hours with a private tutor to review practice tests, set up a study plan and help with grad school applications, as well as access to both the GRE Math Foundations and GRE Advanced Math– Self-Paced courses, all in addition to the basic Live Online course. This feature cannot be underestimated. The best ways to gauge your performance, improve it, and help you develop the stamina to take the GRE is to take full-length practice tests. Kaplan gives you seven opportunities to do so, unlike most of their competitors who only offer three or four. 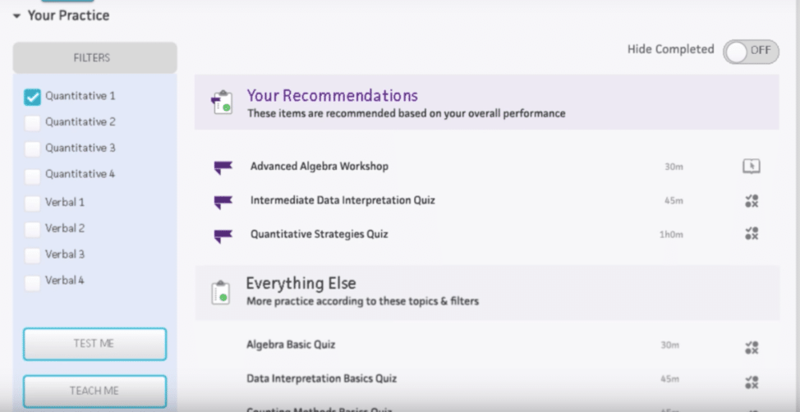 With Kaplan’s Smart Report, you are given a personalized breakdown of your practice test performance so you are able to customize your study sessions. 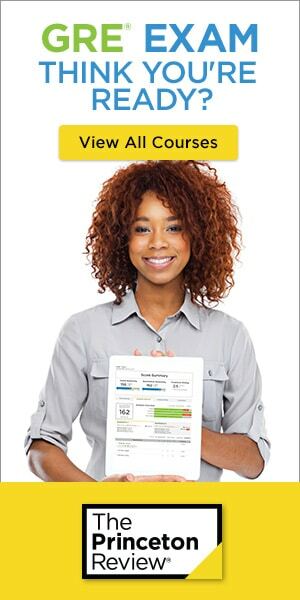 Only The Princeton Review’s GRE course has more. 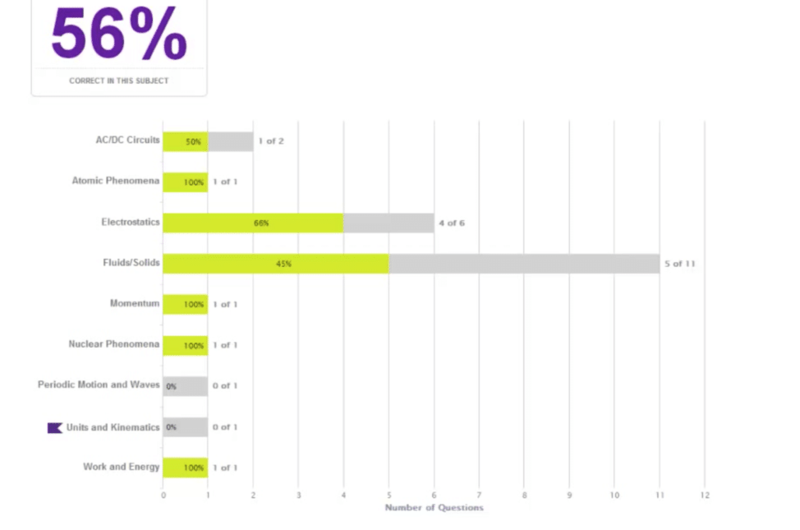 Kaplan’s quiz bank offers over 5,000 practice questions, compared to the 1,000-3,500 offered by most of their competitors. It is the most in the industry, and offers students near endless opportunity to develop GRE test taking skills. 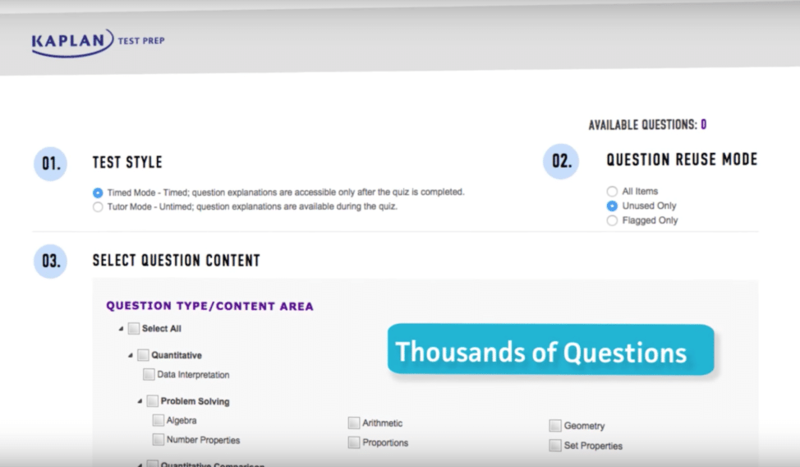 When using their quiz bank, you are able to filter the type of question by type and difficulty so you are able to focus your study time on the skills and questions you have the hardest time with. You can also use timed mode which simulates the actual test, or tutor mode, which reviews the questions as you answer them. Most students don’t get close to answering 5,000 questions, but it is nice to know that most likely you will not run out of opportunities to practice. GRE Premier: Course Book Edition, GRE Math Workbook, GRE Verbal Workbook, and GRE Pocket Reference. The online courses integrate seamlessly with the material from the textbooks, and are designed to complement each other. The books are also available for purchase separately. 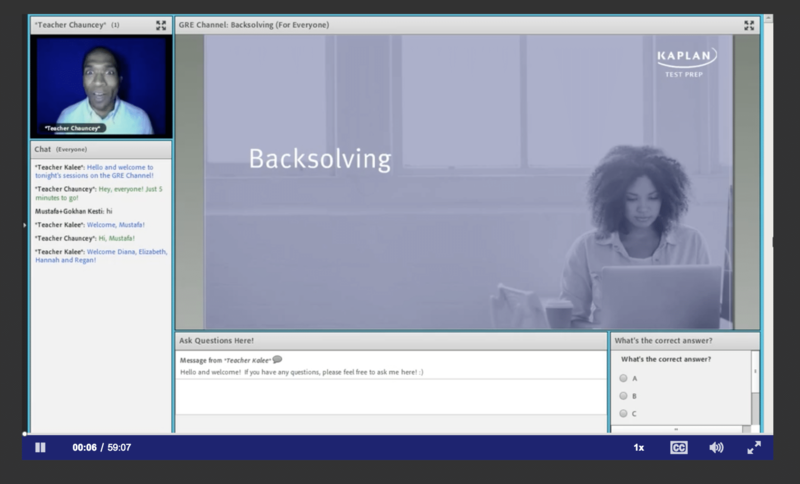 Kaplan offers a GRE channel for streaming live or on demand interactive lessons and instruction from their GRE experts. This is more live and interactive instruction than any of their competitors. From fundamentals to advanced skills, the GRE channel allows you to choose the episodes, difficulty level, and topics that you need to watch the most, including strategies for algebra, geometry, vocabulary, statistics, and text completion. They introduce 15-20 hours of live programming each week, with new episodes each day, Monday through Friday. This is the most live instruction for the GRE available anywhere. All episodes are archived, so you can watch them anytime, offering an almost endless amount of customizable content. The GRE Channel is available to anyone enrolled in any live instruction or Self-Paced PLUS GRE courses. All of this is available to you for six months, which is longer than many of Kaplan’s competitors. After taking a practice exam, Kaplan provides a trademarked Smart Report, a guide that breaks down your individual performance so that you can track progress and determine your personal strengths and weaknesses. It is designed to tell you which specific area to study to potentially see the greatest score improvement, giving you the ability to best use your time. From the dashboard, you can go to Smart Reports to see exactly which areas are strengths and which areas are “opportunities” for improvement. A chart illustrates how your test scores trend over time, and you can get overall information about your percentiles and scaled scores for each test, as well as more specific information on each section. After you have identified your 3 areas of strength and your 3 opportunities for improvement, you can follow the customized recommendations for future practice based on your performance. From the Kaplan website, get free information about the GRE and the graduate school application process, register to get free 20-minute workouts (try out GRE practice questions, get solutions and explanations), register to receive one free sample question a day for three months (i.e. “Question A Day”), gain access to live practice test options, an on-demand practice test, a sample class, and a pop quiz. 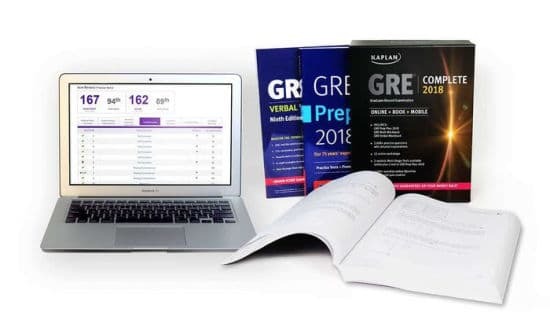 In addition to the free resources available on their website, Kaplan frequently offers free GRE prep events, including online overviews, sample classes, and strategy sessions. They also give you access to a free GRE Prep Starter Pack offering you 7 days to test out the service. The starter pack includes on-demand lessons, a study plan, and skill-building drills. If your GRE score doesn’t improve after you have completed an entire Kaplan course, you can get a full refund (you must provide a previous official GRE score to meet this requirement). In addition, if you are unhappy with the course or your GRE test results for any reason, you may retake the same course at no additional charge, no questions asked. (Although retaking the basic course is free of charge, discounted rates apply if you add a tutoring option.) 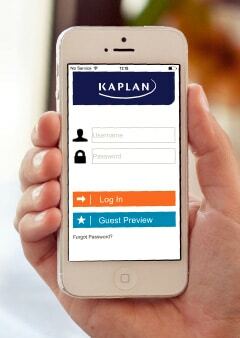 See Kaplan’s website for full details. Kaplan understands that GRE success goes beyond just preparation, and that feeling comfortable in your environment is an important part of doing well on the GRE. They are the only test prep provider to offer you the option to take a practice test in an actual Prometric testing facility, giving you the confidence and familiarity for your actual test day. The course comes with the GRE Flashcards by Kaplan app (for both iOS and Android devices), which is great for studying on the go. Get access to 500 flashcards that include high frequency GRE vocabulary words, synonyms, definitions, and sample sentences. Quiz yourself, create customized sets of cards, track your progress, and see performance statistics right from your smartphone. For students who are not ready to commit to an entire course or tutoring package, or those who need to brush up on just a few specific skills, Kaplan also offers smaller packages for you. For students that haven’t done math since high school, or feel a little rusty, they offer a Rapid Review Live for GRE Math, allowing you to refresh your skills. This is a perfect way to get an introduction to Kaplan online courses, quickly review foundational math topics, and learn GRE specific strategies from Kaplan’s expert instructors. Lastly, they offer a GRE Strategy review, which teaches students how to more efficiently answer GRE questions. This is a timed quiz after all! Kaplan has designed their tutoring options to supplement their courses. All tutoring packages come with access to a Kaplan course. You are able to schedule your tutoring around the classes. You can use the classroom time, quizzes, and practice tests to determine what to focus on during your tutoring sessions, or review anything that you’ve just covered in the classroom. The plans are flexible and customizable, and can be scheduled almost anytime and anyway you would like. Although private tutoring is never cheap, if you add tutoring onto a course or choose any of the three tutoring packages, your prep course costs will quickly exceed $1,000, and add up to more than $2,000 if you go with the private tutoring packages of 15, 25 or 35 hours. The tutoring options are also somewhat inflexible. They only offer tutoring packages, so if you are interested in just a few hours, there isn’t an option for you. The tutoring options are also somewhat inflexible. They only offer tutoring packages, so if you are interested in just a few hours, there isn’t an option for you. Kaplan offers quite a few a la carte options, which keep the price down. However, the starting price for their courses is higher than many of the other options. For lower priced options, take a look at this overview comparing the best GRE test prep courses. The Kaplan Flashcard app is certainly helpful and a great tool. 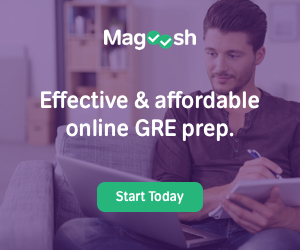 However, Kaplan doesn’t offer a general GRE test prep study app, like Magoosh and other providers. While you are still able to access the site using mobile, it is better suited for a computer rather than a table or phone, which could limit some studiers. Both traditional and online learners can benefit from Kaplan’s customizable GRE prep options. The self-paced option will suit self-motivated students who are looking for the flexibility of an online-program without classes to attend or homework assignments that are due on a particular day. The 7 full-length practice exams and the Smart Report performance analysis feature will help students identify strengths and weaknesses and customize their study plan to achieve a higher GRE score, all on their own schedule. The In-Person and Live Online options allow for more one-on-one opportunities to interact with instructors and ask questions. Tutoring is available at an additional cost for those students who need extra help. Limited 3-month access means that this course is best for those students who will be taking the GRE within the next 4 months. Kaplan has one of the most versatile GRE courses on the market. Choose from in-person sessions in many cities, live online course options, and the ultimate convenience of a self-study course. Or choose a personalized tutoring package that comes with online access and all the perks of a full course. Try before you buy with Kaplan’s free resources. We also like the risk-free offer: retake a course for free if you are not happy with your test results; or get a full refund if your official GRE score from a previous exam does not go up. (Make sure to check the website for all requirements for their guarantee.) Try Kaplan today, you won’t be disappointed. TAKE ME TO KAPLAN GRE! Includes: 8 recorded instructional video sessions, 5,000+ practice questions, quiz bank to create custom quizzes, 7 full-length computer-based practice tests, 180 hours of online instruction and practice, email-based support, GRE textbooks: GRE Premier: Course Book Edition, GRE Math Workbook, GRE Verbal Workbook, and GRE Pocket Reference (Kindle option available), and flashcard app. Recommended for: The self-starter who is highly familiar with the GRE format and disciplined enough to create and stick to their own study schedule. You won’t have access to live instructors like Kaplan’s self-paced and Live-Online courses, so this isn’t offering isn’t for everyone. Recommended for: The ambitious self-starter. For most, the regular self-paced course from Kaplan has more than enough resources to study from and learn the material. However, the Advanced Math questions can give you an extra lift on the Quantitative Reasoning section if you’re looking for a slight edge on the competition and the tutoring sessions can be invaluable to individuals struggling on specific sections. Includes: 8 live online class sessions, 5,000+ practice questions, Quiz Bank to create custom quizzes, 7 full-length computer-based practice tests, 180 hours of online instruction and practice, free make-up sessions (live online sessions or on-demand), GRE textbooks: GRE Premier: Course Book Edition, GRE Math Workbook, GRE Verbal Workbook, and GRE Pocket Reference (Kindle option available), and flashcard app. Recommended for: Individuals who can hold themselves accountable and don’t struggle focusing in environments other than the classroom. This is my top choice from Kaplan’s offerings and is as comprehensive of a course as you’ll find. Kaplan’s In-Person GRE prep course offers the same resources as their Live Online course, so the best course comes down to what your optimal learning environment is. Recommended for: Students who have difficulty focusing at home or in a coffee shop or those who enjoy the personal camaraderie of learning with others. Includes: in-person or online one-on-one tutoring, 15-, 25-, and 35-hour packages, full access to the Kaplan GRE course materials, plus enrollment in either an In Person or a Live Online course, GRE Premier: Course Book Edition, GRE Math Workbook, GRE Verbal Workbook, and GRE Pocket Reference, and GRE flashcard app. Do many people do the in-person sessions?? The in-person sessions are awesome if they are in the area you live and are willing to spend the money. You can check out the details when clicking through to Kaplans site. We would recommend the live-online or in-person if you like studying with other people. The best part about this package is the ability to have your essays professionally graded. You can get a variety of books to with Q&A over math and verbal, but how do you know where you stand for the written portion? I have sent may essays for grading and got them all back within a few days or even same day in some cases. The support staff is prompt to respond to comments and questions. My biggest complaint is that the site is kind of hard to navigate. There are lots of extra links to go to and no outline so you can quickly find a reference point when you are lost on how to find a specific area. Additionally, some times the explanations can be a bit confusing or the coding will give an error, but a quick email will help you out. Thanks for the feedback Kristine. I’ve gotten similar feedback from others using Kaplan. With that being said, relative to the competition, they are more organized than most and generally get back to more quickly than other GRE prep providers. I wish you all the best studying to Crush the GRE!